Andromeda’s replies are in bold. First, tell me about you and the cello. When and why did you start? I started playing at the age of 6, and played on and off again as a child. I don’t recall my parents overseeing my practice very much, and both lessons and instrument rentals were haphazard. I didn’t get far, though I loved the sound of the cello so much that it made my heart ache, and still does. I remember being in a school orchestra in maybe 5th grade. We were playing Pachelbel’s Canon in D and as ridiculously simple as my part was, I got lost and stopped playing. But the funny thing? I wasn’t embarrassed. I just sat, and listened, and was moved to tears. I remember leaving the concert very happy and at peace. Perhaps that was my only wise moment, being content as a listener rather than a as a performer. A decade ago, when my daughter was one year old, I decided I wanted to play the cello again, in a more dedicated and rigorous way. At one point I started writing a memoir about my experiences as an adult amateur cellist. (A book with an overly focused audience, no doubt!) I put that project on hold, but later, it helped inform the research that ultimately became the foundation for my book. With this novel, I’ve come full circle. What started out as a project focused on my own minor ambitions and frustrations turned into a story about the cello and about the importance of the arts in general. Nothing pleases me more than getting emails from readers who didn’t listen to the cello until they started reading the book. The novel has been published in 10 languages and I’ve heard from music lovers, including many amateur cellists and pianists, in several countries. As a student of the cello, what do you struggle with most? Goals, expectations, and life balance. It’s hard to work one’s way up the fingerboard, it’s hard to avoid tension (and I have had wrist and hand pain that forced me to stop playing for months at a time). But hardest of all is finding a way to fit music into one’s life. This is both a scheduling issue and a life philosophy issue, requiring me to answer both the question “What priority do I make the cello in my life? What will I give up in exchange?” and “Why do any of us play music or make art? What is it all for?” I think the hardest thing for those of us who have modest abilities but a deep appreciation for music is figuring out where we fit in the big picture. Ambition is not the issue. I know I’ll never wow anyone with my cello playing. When I get flustered (especially around others), I botch even the simplest counting or note-reading. But I need solid goals or I don’t make time to practice, without practice I don’t improve, and without improving, I don’t have those joyful, transcendent moments when something sounds so much better than it did before – when it actually sounds like music! I’ve had many fine teachers, but locally, I haven’t found that tough coach (in the form of another person or within my own mind) who can help me determine the highest I can reach and precisely, in baby-step increments, how to get there. I have to confess that I actually took a break from cello this summer, while I was taking piano lessons; I plan to start cello again this fall. As for my ultimate goal: About 10 years ago, I was traveling on a Seattle ferry. On the boat, a young woman was playing a Bach Cello Suite. Some people were ignoring her; others, like me, were absolutely enchanted. I don’t think she was too worried about the crowd, either way. The boat, Puget Sound, Bach, people milling about, the ephemeral nature of this chance “concert” – it was wonderful. I’d love to be able to play that way: well enough (and unselfconsciously enough) to please myself and a few others, without being a nuisance. The music scene is Alaska seems to be hopping. What’s it like? Any key differences between other places? For a medium-sized city, I think we have a fair number of concerts. Last weekend, Wendy Warner visited and opened the symphony season with Prokofiev’s “Sinfonia Concertante for Cello and Orchestra in E minor.” We have opera, a civic orchestra, chamber concerts. I think the best thing is how appreciative audiences here are; we may seem provincial when we clap as hard as we do for visiting soloists, but I’d rather be in a place where people aren’t jaded. Also, it’s fun to go to major symphony concerts where the dress code varies from gowns and tuxes to jeans and flannel. In Alaska, anything goes. The Spanish Bow. Why not the Spanish Cello? Do you have a special fondness for the bow? Because it’s all about the bow, isn’t it, Emily? I wish it were all about the lefthand, plonking down the fingers (as even I can manage to do, on occasion.) But the right hand is responsible for the more subtle artistry, requiring various combinations of pressure, speed, distance to the bridge, and so on. Now, in my novel, the bow actually has additional narrative significance, in terms of both plot and symbolism. Feliu’s father bequeaths him the wooden stick (which comes from the New World); his mother struggles to pay to have the bow haired; Queen Ena of Spain gives him a gemstone to reward Feliu for his loyalty, which is added to the bow’s frog. The more that is added to the bow, and the more people help him or demand things of him, the more burdened Feliu feels. He becomes convinced that he must produce something tangible with his cello playing, and actually use it to make a difference – ultimately a political difference – in war-torn Spain. But the harder he tries, the less flexible he becomes. He may have a reputation as a musical innovator and as a hero of sorts, but Feliu also becomes trapped by his own ego and inflexibility. What was your best cello moment? ent homeowner, I asked Morales to play a few of the Bach Suites for me in the living room of the former home of Pablo Casals, where the maestro himself used to play Bach every day. The tropical setting, the regal atmosphere of the home, the photos of Casals on the walls, and Morales playing all created a one-of-a-kind private concert. What was the best thing you ever did to improve your own cello playing? I attended a cello camp called the Black Glove Cello Festival in Utah. It was an inspiring and forgiving atmosphere, including the final concert, when we put on an almost-all-cello concert. Wanting to play with other people again, in that kind of easygoing atmosphere, gives me a reason to commit to the cello all over again. I could feel myself improving every minute I bowed and breathed and kept time and matched pitches with the other amateur or semi-pro cellists playing all around me. What kind of cello do you play? 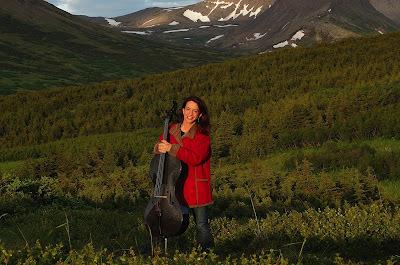 About two years ago I switched to a black carbon-fiber cello, which I love. It survives Alaska weather so much better than wood and I don’t have to feel guilty about mistreating it. One of my prize objects is my bow, which doesn’t have an inlaid sapphire (as Feliu’s bow does) but does have a mother-of-pearl-moose. Some additional information about our girl: her website is www.romanolax.com (music clips, maps, and other extras there); she also has a virtual book tour blog at www.thespanishbow.blogspot.com. Andromeda lives in Anchorage, Alaska with her husband and two children, who are homeschooled. She is at work on a second novel about Victorian-era archaeology, set in the Middle East.